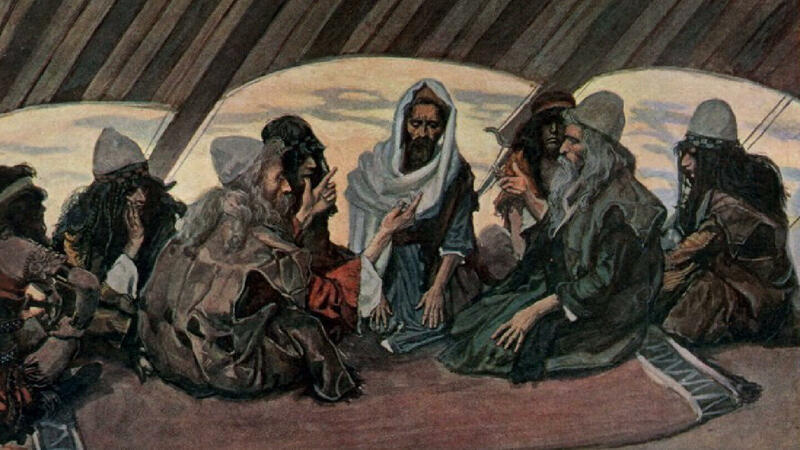 This week’s Torah portion, Parashat Yitro (Jethro), starts with Jethro bringing back Zipporah, Gershon & Eliezer to Moses. They had been staying with him for a while and Jethro had decided that it was time for the family to be reunited. Moses told his father-in-law all about what the Lord had done for the Israelites. Jethro was delighted and brought sacrifices to the Lord. Joined by Aaron and the leaders of Israel they shared a meal in the presence of the Lord. Jethro noticed that it was a hard job for Moses, answering questions from the Israelites all day long. He himself was a religious leader, a priest of Midian, so he had some experience in the matter. He advised Moses to teach the people the will of the Lord and to install competent & God fearing, incorruptible & honest men to help him lead the people. This way Moses would be able to just deal with the most difficult cases and not get burned out. Moses followed the advice of his father-in-law. He installed leaders and began to teach the Israelites the instructions of the Lord. Moses gave detailed instructions to the Israelites. The Lord was going to speak to them. They were to wash their clothes, refrain from sexual relations, the mountain was not to be touched on punishment of death. On the third day Moses brought the people out of the camp to the base of the mountain. They were to meet God. The Lord descended on the mountain in fire. There was thunder and lightning, smoke, the loud sound of the shofar and the earth trembled. The Lord sent Moses down to the people with again the warning that they were not to go up the mountain. Moses seemed to not take the warning too serious, but the Lord insisted. He went down, told the people, and together with his brother Aaron made his way back up. The Lord God spoke, with a voice, famous words that later became known as the Ten Commandments. Of all the laws and instructions, the Lord was going to give, these words were the most essential. These were the words the Lord spoke directly to the people of Israel. These were the words they heard with their own ears. It had been three months since they left Egypt, the life of slavery, where the way to survive was to look out for yourself. And the Lord is giving them new instructions to live by. Words that were summarized later on. Honor the God that gave you your freedom and take care of those around you. It is no longer survival of the fittest. You are no longer slaves. You are free. Put aside whatever you used to survive, and start living life as free men. Muriel Stern has a lifelong love affair with words, specifically with the Word. It is her hope that with her writing she does honor to the Author and inspires others to fall head over heels for the Creator as well. Muriel & her husband Daniel reside in the City of the Great King. Their four children love books as much as their parents.